Allergies aren’t just a human thing – our pets get food and environmental allergies too, and they can be some of the most frustrating conditions to diagnose and treat. Today we’re going to dive more into allergies – read on to learn about environmental allergies (atopic dermatitis), and check back tonight for our article on food allergies! 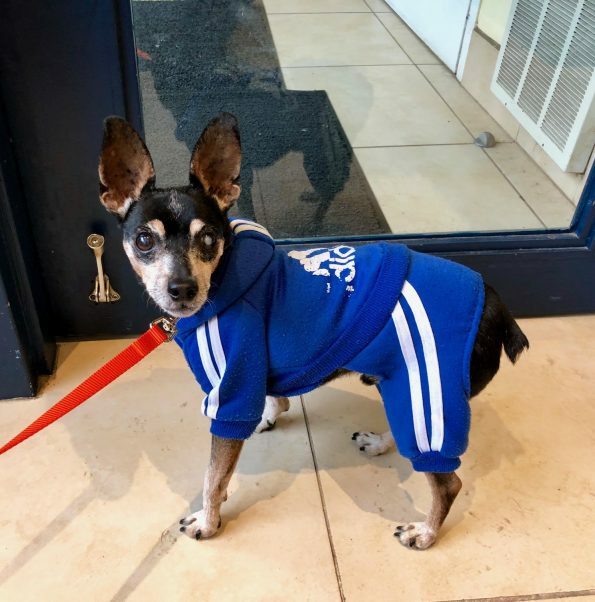 Our featured patient is 13 year old miniature pinscher Sunny, who has been getting monthly injections of Cytopoint since last fall, to help control his atopic dermatitis. His stylish leisure suit also helps prevent him from scratching! 🙂 (Cytopoint is a once monthly injection that mimics dogs’ natural immune system and targets cytokines to help break the cycle of itch and inflammation. It is well tolerated and safe to use). It is important to note that many allergies have multiple causes and can be a combination of environmental allergies, food allergies and concurrent infections. If you suspect your pet may be suffering from allergies, give us a call – we can help you work through the diagnosis and treatment process, and get your pet feeling great again!